Women’s golf clubs are those that are specifically designed keeping the requirements and needs of the female golfer on an average. The shaft length and the shaft flex tend to be far different when it comes to women’s golf drivers as they tend to prefer a lower swing speed in comparison to men. In order to be able to pick out the best women’s golf driver in 2019, there are some well-known golf driver reviews that are worth keeping in mind. When you are a beginner at the game of golf, you don’t require all the fourteen clubs that you are meant to play the game with. Instead, it is a far better idea to buy a small set of very competent drivers and you can then keep adding to this collection as and when you keep progressing with your gaming skills. 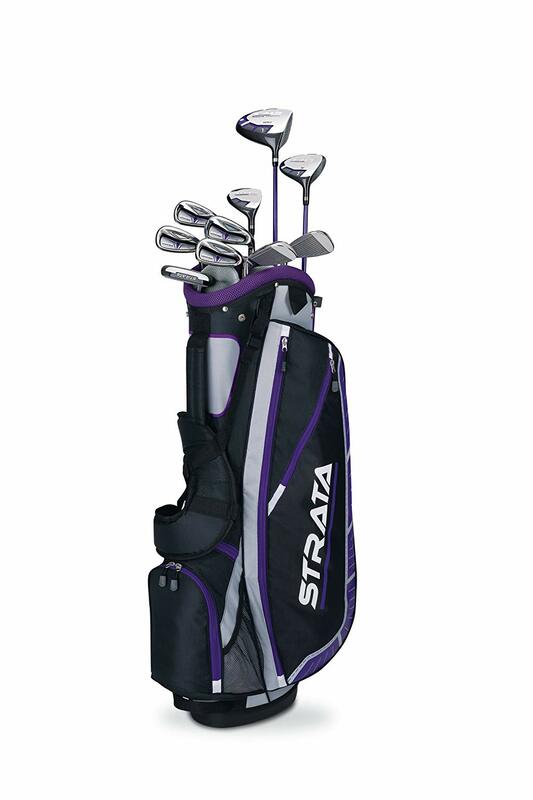 The Callaway Women’s Strata Golf Club Set is one that is certainly worth owning as it comes with a 5 wood, a forgiving driver, a 5 hybrid, a putter cover, a sand wedge, a couple of irons and some other basic equipment that you need to in order to play the game of golf as comfortably as possible. This is a set that also comes with a number of head covers for the wood, hybrid and driver and a bag for keeping all this stuff in. 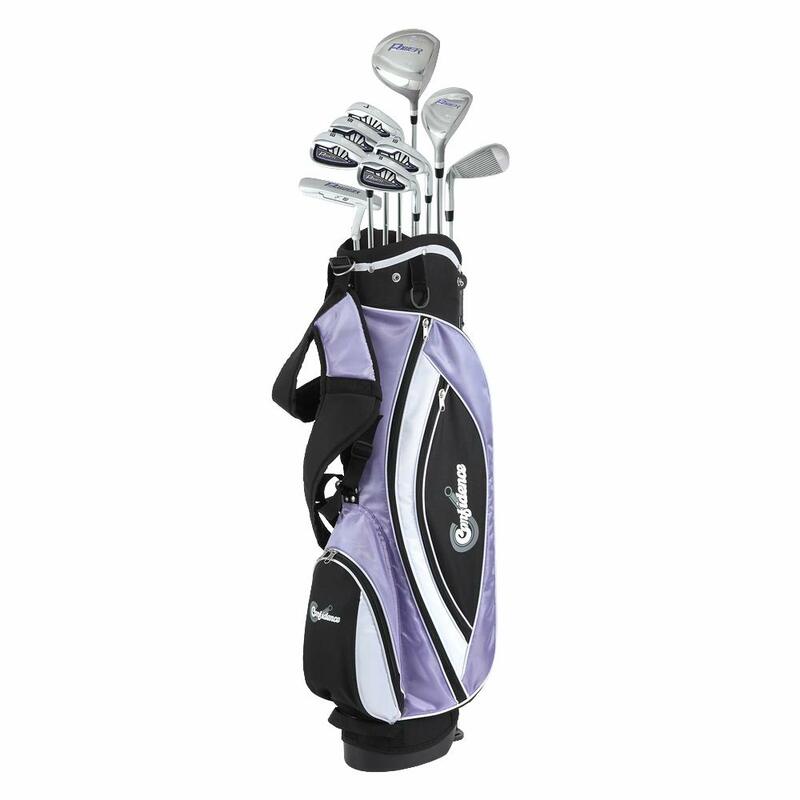 While this is a set that should be more than sufficient to own if you are a woman who is just starting out in the game of golf, there is also a complete set on offer that you can buy for keeps. Using the Callaway Women’s Strata Golf Club Set is well suited for beginners and its forgiving drivers in particular are quite easy to handle and use for its sheer light weight. Women who specifically struggle with clubs due to shorter heights would find them perfect fit with a relatively long shaft. The accompanying golf bag look attractive and good to store away the golfing equipment that you won’t be using immediately while playing your game. 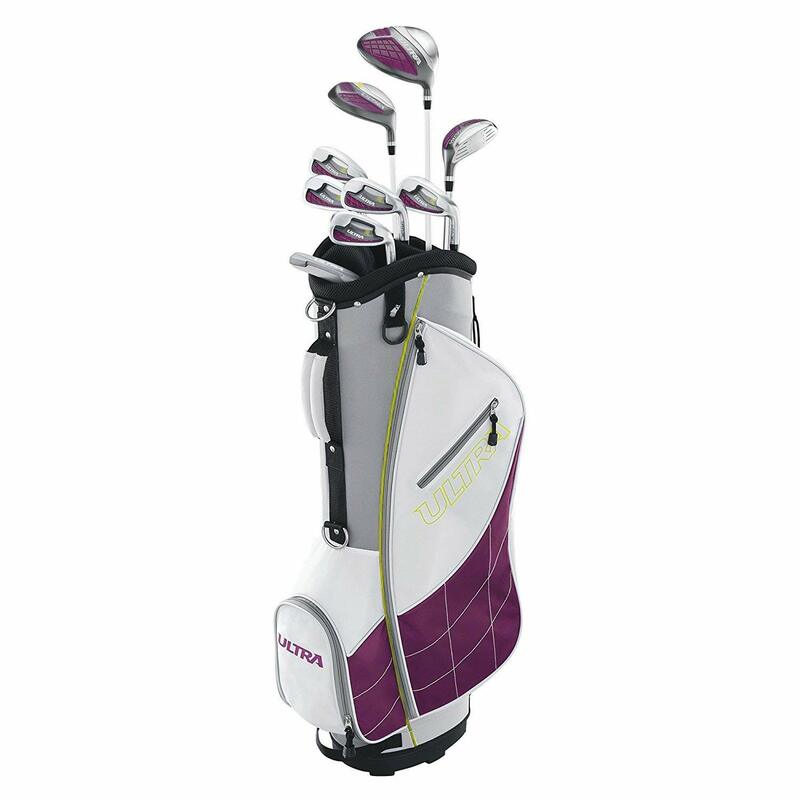 If you are looking to engage in full rounds of games on a golf course, then owning this Wilson Ultra Ladies Complete Golf Club set will be a good idea. It comes with a putter, a PW, a full set of irons, a four hybrid, a fairway wood and a driver. In addition to all this equipment, the set also comes with a cart bag that features a strap, making it easy for you to carry it around. While hard to hit irons have definitely been given a miss in this golf club set, there are plenty of distance options that have been kept alive with the fairway wood and the graphite shafted driver. The set’s steel shafted irons make a great addition to it and if you have been looking to progress from a golf club set for beginners to a more professional set, then this would be the right golf club set for you to buy. The decently sized drivers gives you plenty of confidence when you use it out on the golfing crease, not getting too stiff in your hands when you maneuver it to hit the golf ball as best as you can. Minor design flaws with bag, makes it tough to move around with, at times. The absence of graphite shaft on the irons may make it rather difficult for players to get distance with their shots. The Wilson Ultra Ladies Golf Club Set is a full and complete set of golf club drivers that you should not hesitate to buy and use if you are looking to make considerable progress in your game. This is not really meant for beginners and instead helps you to enhance your existing skills at golf. The high quality graphite shaft is conveniently sized and will make it easy for you to take swings with it on the golf course. The driver is characterized by high levels of forgiveness thus giving you the scope of getting your shots as high up in the air as possible. The accompanying bag is convenient too in spite of design flaws as it reduces the need to carry all the drivers with you in hand when moving from one end of the golf course to another. This is a golf club set that is recommended very highly by experts due to the relaxed disposition of the clubs. With a Driver meant for beginners, steel shafts can really improve a person’s game and make her seem like a pro out on the course. The club head size is marked at 460cc and is characterized by adequate forgiveness levels, letting players take long and high shots when using it to play the game of golf. The 4 hybrid that comes with this set is one that makes it easier for players to get some extra distance compared to what a long iron could do. Stroke play also becomes far easier to carry out than usual with the help of the 4 hybrid. The set comprises of cavity back irons with high quality steel shafts, providing added feedback as well as control. The putter in the set is of a hybrid and semi mallet style and there is also a stand bag characterized by auto pop legs, making this set a truly completely package. The club heads are made of high quality iron and produce wonderful sound, feedback and feel upon impact. Yet these are not as professional looking as the club heads that constitute a part of other golf club sets. The fact that the drivers are equipped with steel shafts, make it possible for even women golfers with a high handicap to do well using them. Procuring this set can be a great thing to do since it is not too expensive to buy either. You do not have to end up spending a fortune if you want this set of golf clubs in your possession. Apart from ensuring high forgiveness levels, reduced ball speed and a top performance in general on the golf course, this set of drivers is of top notch quality too and can last over a good number of years before displaying any sign of wear and tear or damage. What To Look For In Golf Clubs For Women? The golf clubs for female golfers are those that are far lighter in weight than the regular golf clubs in the market. While the club heads of drivers meant for women are those that are constructed with heavy irons, the driver on the whole is kept as light in weight as possible so that it is easy for women golfers to swing around with it on the golf course. Even the sturdiest and strongest of women are known to prefer drivers that are light in weight, due to the fact that these are easier to handle when playing the game. The man in the video very well summarizes why do women fail at golf, a valuable insight before by an experienced golf club manufacturer. The shaft of a driver that is used by a female golfer is known to be far more flexible as well than a driver that is used by a male golfer. The shaft is also lower or shorter in size, giving the female golfer a perfect grip over it. Although the shafts for female golf drivers are lightweight, these are also constructed using high quality graphite, as is the case with drivers for male golfers. The graphite shafts are of better quality and ensure good performance when used. The golf drivers that are designed for women golfers in particular are known to have higher loft angles. This is done to ensure that the shots generated by female golfers are those that go high up into the air, and far away from the fairway or the tee. Women’s golf drivers have a shorter and thinner grip as well. The fact that this is the case is quite logical since the size of a woman’s hand is far smaller than the size of a man’s hand. The grips on the clubs of ladies are those that can be easily distinguished owing to the softer pastel shades which are used. The women’s golf drivers are known to come in a number of vibrant shades especially the club head and the club face. As a result, women can create quite a wonderful style statement when they carry these out onto the golf course rather than just them to play a good game. A golf driver for a woman tends to be as strong and as durable as the driver used by a male golfer. These are always constructed using high quality iron and graphite and are capable of lasting for a good number of years before being replaced. The basic characters that differentiate ladies golf clubs from that of men’s is their weight & flex. Lighter Clubs make it convenient for female golfers to handle and maneuver for better accuracy, trajectory and improved distance. For beginners Callaway Strata Plus is the best bet for the brand’s sheer experience and appeal with the golfers. However for seasoned golfers there are many other options as well but for beginners I’d recommend taking up any one of the above Ladies golf club sets.